Microsoft has missed a trick or two in the heartland of its business but complex mobile working remains an issue for all in the tablet market. Looking at the different headlines around the latest version of Windows, it is forgivable for a person to be somewhat confused. Is Windows 8 the best thing since, well, Windows 7, based on it selling faster than anything else Microsoft has ever put out there; or is it the biggest dead duck since Windows Vista, based on Microsoft being too late to the market and missing the point? The answer is probably a mix of the two – and the finer points need looking at to understand where Windows 8 is at the moment and how other systems are affecting it. First, Windows 8 is late to the game. Apple has managed to wrest a large number of users over to its side through well-designed devices that are so simple to use that the majority of users happily bought the fashion statement of the Apple iPad tablet and used it alongside their company machines – the vast majority of which were and are based on Windows, even if this is XP. According to StatCounter, XP usage is still running globally at just under 25% of all desktop systems – and the majority of this use will be in organisations. The majority of iPad users did not desert Microsoft. The real problem lay in the fact that although the iPad is a fantastic device for consuming information from the web and emails, it is pretty poor when it comes to creating usable information on the go. Yes, emails can be answered; Facebook posts can be posted; tweets can be tweeted. The soft keyboard is OK for ad hoc use, but it isn’t a patch on a proper keyboard. Try and create a PowerPoint-style presentation on an iPad – it isn’t easy. Try and deal with a complex spreadsheet – you’ll want your PC or laptop to be with you pretty quickly. Even with an external keyboard and a suitable support stand, the iPad does not seem to be there for serious business content creation – and once everything starts to be added, you are back to many of the problems of old: multiple wires for connections, even if it is only to keep everything charged up. Bluetooth connectivity has removed the need for hard connections in places – but power is still the main problem. Apple has made a great job of many parts of mobility – but where does it go next? The first real contender to Apple’s tablet dominance came through from the Android camp. With a more open platform, Android was attractive to the person technical enough to understand the difference between an open platform and a walled garden – but the general public was initially less impressed with the often underwhelming “me too” Apple designs and the paucity of choice of apps that could be easily downloaded. By the time the Android app store had enough (and suitable) apps, there was then the problem of the different versions of Android that were out there. From the Gingerbread release in 2010, there has since been Honeycomb, Ice Cream Sandwich and Jelly Bean. Many suppliers had designed tablets that were dependent on a specific Android release, and this meant that newer functionality and improvements from later releases could not be applied to their tablets – something that Apple had managed to handle reasonably well, even when its iPads and iPhones could not support later iOS releases. However, the latest versions of Android-based phones and tablets are taking market away from Apple – and Apple has responded through its patent storm, accusing many other suppliers of using patents that it owns in their devices. This seems to be backfiring, as courts either find against Apple or are reversing findings for them on appeal, or massively reducing any fines applied to other suppliers. Meanwhile, with the other parties involved in legal shenanigans and upgrade wars, Microsoft launched its Surface RT tablet. Based on a cut-down version of Windows 8, specifically aimed at long battery life touch tablets, the Surface RT devices came with the Modern UI (formally known as Metro) and a special set of apps written for the Windows RT environment. Surface RT could not run existing Windows applications – everything that it does run has to be from directly within the Modern UI. And this was a problem for Microsoft. 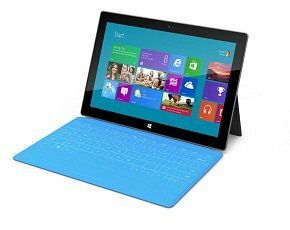 Unlike Apple and the Android suppliers which had no large history of applications to support, Microsoft was issuing a tablet that was not “Microsoft” enough. It competes well with Apple on the design front; the Modern UI works well and battery life is good. But it suffers from the same issues as the iPad – even with the included keyboard built in to the jacket, it is not very good at content creation – and sales were okay, but not amazing. Microsoft also did a poor job of pushing its hardware partners to come up with interesting and innovative tablets themselves. It took a long while before full-blown Windows 8 tablets came to market capable of running not only Modern UI apps, but also all the existing Windows applications that users already had. Finally, the likes of Dell, Lenovo, HP, Asus, Sony came to market with Windows 8 tablets – and although some of them were innovative, they also had big problems. The main trouble with full Windows 8 is that it needs a “proper” CPU. Low-voltage, low current Atom or ARM chips that are used for Windows RT cannot run Windows 8, and so full Intel i3, i5 or i7 chips are required. The Atom Z2760 system on chip (SoC) unit as used in many Windows RT devices has a maximum power drain of 1.7 watts. In comparison, the Intel i3 3217U CPU as used in the lowest spec Sony Duo Touch Windows 8 hybrid tablet runs at 17W – 10 times as much. This means that whereas a Windows RT tablet can run for a whole working day without the need to make a visit to a power source, the Windows 8 tablets tend to run out of power halfway through the day. And these are not like an Apple iPad – it is not just a case of a single small adaptor and a USB-to-proprietary connector cable. Instead, a heavy laptop-style power unit is required, adding around 0.5kg or more to the considerable weight of the system itself. But systems such as the Sony Duo, the Dell Inspiron Duo, the Lenovo Yoga, Lynx and Twist all come with that capability that Apple and many of the Android suppliers have missed – they are suitable for content creation. With good keyboards and the capability to run full Windows applications, here are devices which are familiar in many ways to users and yet also have the capability to do things in innovative and interesting ways. This is where Microsoft needs to be making its push. Android suppliers such as Asus have done similar things with the Transformer – but this still means running non-Windows applications and having the risk of a lack of fidelity of content in round-tripping between the office-based (or even Office-based, as in Microsoft’s Office suite of applications) Windows systems and the Android-based tablets. Many can deal with this; some cannot. Microsoft has got to sort out the heartland of its business market. The PC is not yet ready to die and many business users are still tethered to Windows XP-based machines. Windows 8 brings major capabilities to the fore with faster speeds, lower resource footprint and a better security system, yet Microsoft has done little to try and encourage hardware suppliers to get suitable monitors in place to give touchscreen support to the desktop. Only now, nearly five months down the line from the general availability of Windows 8, are monitors that are fully Windows 8 certified coming through to market. Hardware suppliers seem to have bet the farm on all users moving to a completely new device – for an organisation with just 100 desktops in place, this could be an upfront cost in excess of £70,000. This sort of cost is not possible in the current economic climate. Re-use of existing machines with only the monitors being upgraded would make a migration far more likely. What is certain is that Microsoft no longer has an automatic hold on the main device for the user any longer. Apple is getting to the point where it must make more than an incremental step in innovation to remain where it is. The Android suppliers are showing that they can innovate and the growing raft of apps in the Google Play Store is making Android tablets more appealing. Microsoft has to make its play in multiple ways. It has to be able to show the general consumer that it is innovative and interesting; it has to show the business-based road warrior that it supports them in their social, information consuming activities and also in their business- focused information creation roles. And it must also provide an easy and cost-effective upgrade path to a full Windows 8 experience for the PC-based user – of which there will remain many hundreds of millions for the foreseeable future.